The Value of a Pond on Your Land | American Forest Management Inc. 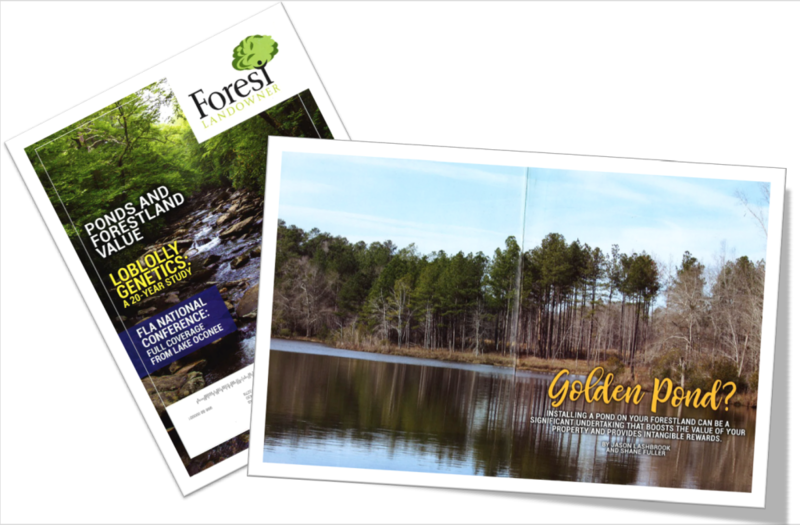 This article appeared in the September/October 2018 issue of Forest Landowner Magazine. There are many benefits of having a pond on your property. A pond can provide recreational opportunities such as fishing, hunting, boating or swimming. It may also impact the monetary value of your property. There is a strong demand for properties with water features, but often, the supply is limited. The purpose of this article is to discuss the recreational and financial benefits of having a pond on your property. A pond can be an attractive asset to your land and a source of great enjoyment. Ponds can take work to keep attractive and clear but can be well worth the effort. As well as the general aesthetics, having fish and wildlife in and around a pond is a large part of the pleasure of owning a pond. Recreational opportunities such as fishing, hunting, swimming or merely wildlife watching are just a few pleasures to be had. A larger pond can attract many species of wildlife such as whitetail deer, turkeys, rabbits, raccoons, turtles, frogs, snails, dove and songbirds. As well as providing a watering source for wildlife, a pond will also provide food resources such as the fish, crawfish, turtles, frogs, and invertebrates that live in the pond. When managing or creating a pond, wildlife populations as well as fish populations can be increased by providing plenty of cover in the form of grasses, trees, and shrubs, especially those that bear small fruits on the banks. Nearly any tree that doesn't drop excessive fruit (such as some crab apples) is fine. Willows are a classic choice, but can spread rapidly and become a nuisance. In colder climates, large clumps of evergreens nearby will provide winter cover. Sunken debris and plants in the pond at various depths will help provide for conditions that all sizes of fish need to survive and reproduce. This provides food, oxygen, shelter and spawning areas. A healthy pond should also have under water “topography”. These various depths provide for year round needs of all species. A monotypic pond will not benefit as many species. Average overall depths should be four to six feet or more if possible and ponds with irregular shapes in most cases provide more benefits too. As long as a pond is fished regularly, you can get a pretty good idea of the health and fish population. Too many fish that are all the same size is an indication that the pond in overpopulated. If you have small areas where rooted plants are a problem, simply pulling them may work. Trying to scoop out the algae and floating plants is usually not effective. Triploid grass carp can be used to eat submersed weeds and can eat in excess of their own body weight a day. Therefore take caution to not stock to many. One to two per acre is usually sufficient. If the problem is very severe, you may have to consider chemical control. However, chemicals usually treat the symptoms and not the underlying problem. Try to identify the root cause of the algae and weeds first. In some circumstances, if the pond has a drainpipe, you may want to do a winter “drawdown”. Drain the pond by one third to one half. This is usually best done from November through March to expose submerged aquatic plants and allows them to freeze and dry. This can be a dramatic step. Therefore it is best to check with your county extension office first or a qualified pond expert. Small ponds can also have problems with oxygen depletion. An aerator will help oxygenate the water and will have the side benefit of keeping water open during the winter which help the fish survive and provides areas for ducks to use. Wood duck boxes can be another source of enjoyment if installed around a pond. Predator-proof duck boxes will encourage wood ducks to use the pond in most areas. Fish feeders can also be installed to provide fun for kids and adults both. Watching the fish feed not only provides for some excitement and added fishing opportunities, but in some situations where food resources are low, they can help provide supplemental feed to sustain healthy populations. As a caution, some wildlife such as Canada geese can create a nuisance with droppings, while muskrats, groundhogs, and beavers can dig into dams, compromising the stability of the pond. There is plenty of information available, and much has been written, concerning the costs and regulatory requirements needed to build ponds. Both of these factors are strongly influenced by the size of the pond being built. As a rule of thumb, excavation costs for a pond less than 20 acres is $3,000 to $5,000 per acre. This cost drops to $2,000 per acre for ponds larger than 20 acres (www.fieldandstream.com, “How to Build a Pond for Bass”, April 30, 2004, Scroppo, Dave). Regulatory requirements are put in place to ensure that ponds are constructed correctly to protect human life and property downstream from the pond, as well as reduce the probability of environmental disasters. These regulations set criteria for such things as dam width and height, soils testing, spillway pipe size, seepage control, etc. They are regulated by state environmental agencies and the U.S Army Corps of Engineers. Regulations can vary from state to state and can be dependent on what the pond is to be used for, which is typically agriculture or recreation. Two factors were analyzed to determine if a pond had a financial benefit to a property. These were bare land values and days on market for sold properties. Sales of small tracts in two southeastern states were analyzed to determine the monetary impact and demand of ponds. The bare land value impact of ponds was determined by analyzing properties sold with ponds since 2015. These sales had a total acreage ranging from 16 acres to 920 acres with an average tract size of 143.5 acres. The pond size on these sales ranged from 0.3 acres to 25 acres with an average size of 4.4 acres. On average, the value allocated to the pond acreage was found to increase bare land values by 6%, with a range of no impact (0%) to a value increase of 42%. Analyzing further, these sales indicate the larger the acreage of a property, the less impact the pond has on land values. Table 1 compares the bare land values without a pond and with a pond for tract sizes of 50 to 500 acres. The table shows that the value impact of ponds is much greater on smaller tract and becomes less as tract size increases. The second factor to analyze is the impact ponds may have on the length of time a property is for sale, commonly referred to as ‘days on market.’ While not necessarily indicating a monetary benefit, the days on market can provide an indication of the demand for properties. Going back to 2017, days on market for properties sold with and without ponds in the subject area were compared. This comparison showed that properties sold with ponds were on the market approximately 50 days less, or a 20% decrease, than those sold without ponds. For both sales with and without ponds, the sales also indicated that the larger the property, the longer it stayed on the market. There are many factors involved in the purchase price of a timberland property. These factors include proximity to population centers, improvements and legal access to name a few. For many landowners, a pond provides recreational opportunities such as fishing and swimming that cannot be valued monetarily. However, a recent analysis of sales indicates that having a pond on your property can provide not only a recreational benefit, but a financial benefit as well. Therefore, it is reasonable to expect a premium value at time of sale if a pond exist. The decision to build a pond must be well thought out. There are legal requirements and financial commitments that must be satisfied to ensure the pond will hold water and not compromise safety. However, if these barriers are achieved, a well-maintained pond will give recreational enjoyment while also possibly providing a financial boost at the time of sale.